Thanks for your interest in the Northwest New Jersey Skylands! To submit an event for publication in our on-line calendar and/or in our publication, please fill out and submit the form below. We will not accept attached documents or your press release. Please also consider extending your listing with a live link, highlighting your event in our newsletter or creating an short term web banner campaign. Also note that we would appreciate a reciprocal link from your website, if you have one. Or at the very least, a vote of approval for our Facebook page. Event Dates: Enter ending date only if different than beginning date. Event Description: 25 words (250 characters) or less! Include times and admission fees, if any. Leave this empty, this field is to detect spam. In return for listing and publicizing your event you must provide a reciprocal link on your website. Or at the very least, a vote of approval for our Facebook page. Please indicate below the location of the link to www.njskylands.com that you will provide for us. Our calendar pages receive from 4,000 - 10,000 visits each month. Our event feed is placed on many other pages on our site. And our email newsletter, "This Week in the New Jersey Skylands" reaches 4,500 subscribers, all current and audited. Placing banners on the calendar page, highlighting your event with photos, or promoting your event in the newsletter or event feed is very effective. These are paid services, summarized here. Please contact me regarding paid event promotions. 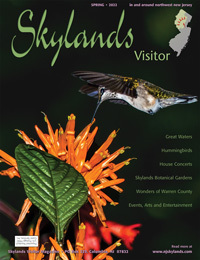 In most cases, we would be happy to provide copies of the Skylands Visitor publication at your event. If you would like copies of the magazine please indicate below how many you need and where they can be delivered.